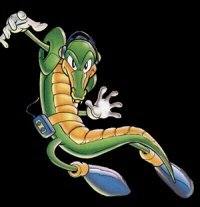 Biography: Vector is the leader of the Chaotix Detective Agency. He needs less then a little green paper in his mind to get motivated. He's quite powerful, and shows this muscle in Sonic Heroes. He likes to listen to his favourite music station wherever he goes.